It’s quite likely that when you hear the word Medellin the first thing that comes to mind is that season of Entourage and how you need to finish watching season two of Narcos. And while the history might be pretty interesting, it turns out Medellin in Colombia has a lot more to offer than Pablo Escobar. Just a couple of decades ago, it was one of the most dangerous places in the world thanks to the Medellin drug cartel, but it’s now considered one of the safest cities in South America. The locals, many of who lived through the height of the drug violence, couldn’t be more welcoming of tourists, and the city itself is pretty amazing. 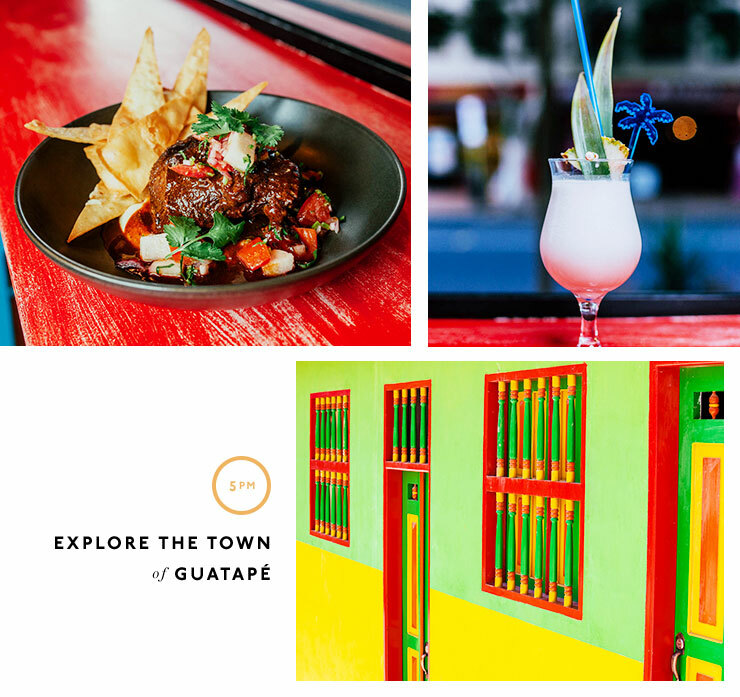 With so much to see, eat and do, you’ll probably want to stay forever, but if you’re planning a whirlwind trip to Colombia and can only afford a couple of days, it’s still definitely worth a stop in! If you’re coming from the airport, jump in a taxi (just remember to agree on a price before you start moving) and head to your accommodation. El Poblado is one of the nicest areas to stay and there are plenty of great apartments on Airbnb so sort that all out before you arrive and your first night will be bliss. If you’re more into hotel living check out The Charlee Hotel and make the most of their rooftop bar. The good food and nightlife is around Park Lleras so the closer you are to that the better. Dump your bags, freshen up and then wander towards Park Lleras. If you’ve found yourself at The Charlee Hotel head to the rooftop bar Envy for a drink. In fact, even if you’re not staying there, go for a drink and enjoy those views. From drinks, head to Carmen for dinner (which you booked well in advance, didn’t you?!). 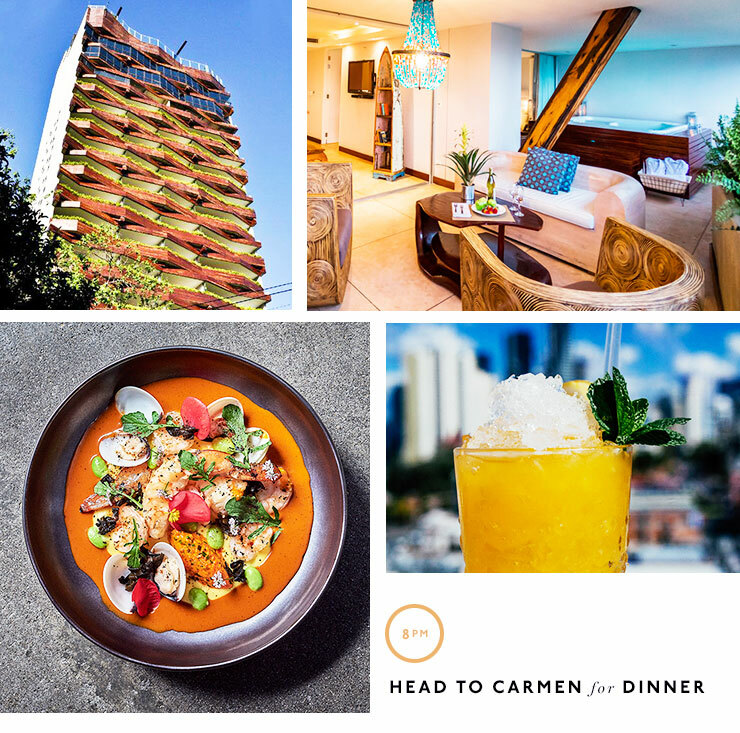 Carmen is undoubtedly one of Medellin’s best restaurants with unbeatable service, great atmosphere and of course, crazy delicious food. The Korean taco is one dish you NEED to try, but you can’t go wrong with anything on the menu. If you have any fuel left in the tank, head to Alta Gracia for a drink to finish the night. This whole street is pumping so if you can’t get into Alta Gracia try your luck at El Social, La Bicyclette or any of the other bars that tickle your fancy. But remember tomorrow is going to busy so don’t overdo it tonight! 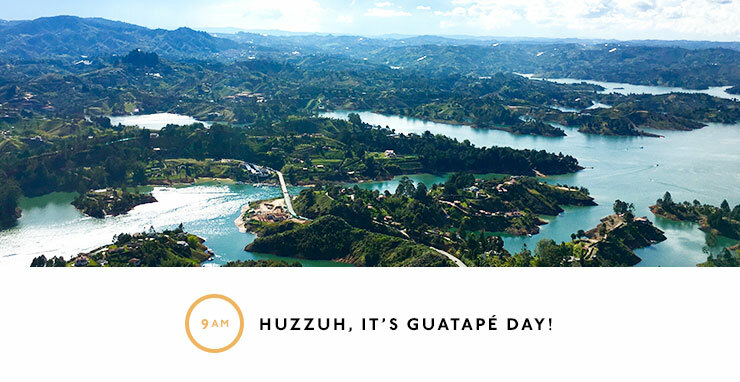 Huzzuh, it’s Guatapé day! Guatapé is a town a couple of hours from Medellin, but the real destination is El Peñól de Guatapé, or the stone. 740 steps up and you’ll get one of the best views you will ever see in your whole life—it’s so beautiful that it’s hard to believe it’s real. You can get to Guatapé on your own but trust me when I say joining a tour is well worth every single penny (and they aren’t all that expensive at $30 or $40 dollars for the full day). If you don’t mind a pretty rustic van and some backpacker vibes, Van por Colombia offers one heck of a day trip, and Rafa the tour guide will be one of the highlights. The van will pick you up in El Poblado and you’ll head to Rafa’s house for a delicious home cooked breakfast. From there you’ll make a few stops to take in some beautiful landscapes and go for a swim. By about 3pm you’ll have made it to El Peñól so get ready to do some climbing. Half way up you’ll be cursing everyone you’ve ever met, but when you reach the top you’ll be pleased as punch. The views are so stunning that you’ll wonder if it’s a movie set and you’ll want to get about 3,000 photos from every single angle so make sure your camera is charged. Head back down the stairs and find the van for one of the most delicious Colombian feasts you’ll ever eat overlooking the lagoon. From there you’ll head to the town of Guatapé and have a wander around. Think bright colourful buildings, cobblestone streets, bars with tables and chairs overflowing on the footpaths and some cute little shops and you’re on the right track. You’ll be pretty exhausted after today, but the nightlife awaits so have a rest when you get home at about and then get back into gear. Head to Humo for dinner, find a table overlooking the street so you can do some people watching and then order yourself a smoking margarita. The food is southern American BBQ with a Colombian twist and it’s freaking delicious. Funnily enough, most of the really good Colombian coffee gets exported so it’s not that easy to find a coffee up to our Aussie standards over there, but don’t worry it’s possible. Pergamino is well known for being some of the best coffee in town and it doesn’t disappoint. The food here is also delish and the vibe is such that you might never want to leave. But you’ve got things to do so drink up and get moving. If you really really really don’t want to go paragliding—even though I’m promising that it’s actually quite relaxing and not scary at all—then head to El Centro. 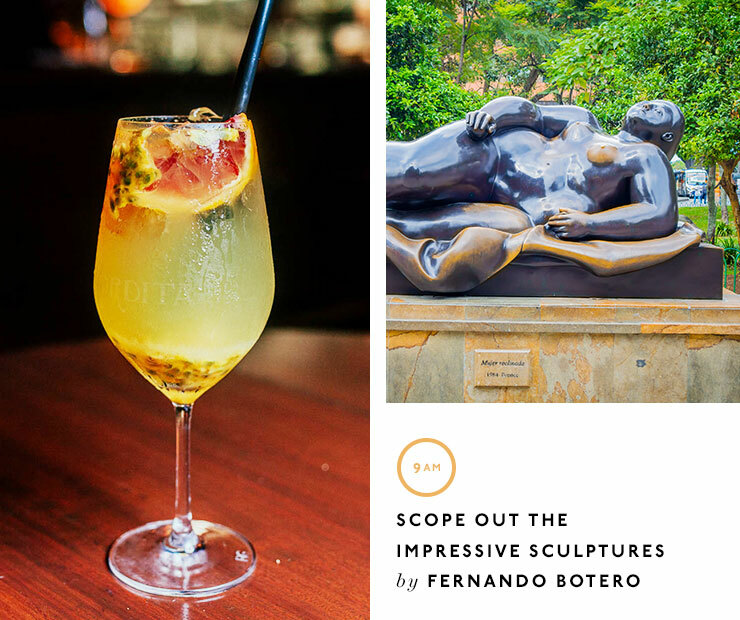 Visit Jardín Botánico for the butterfly house and Plaza Botero to see the super impressive sculptures by Fernando Botero. Take some time to recover from the morning and head to Natto Marcado y Cocina for lunch. The food is fresh and wholesome and just what the doctor ordered if you’ve spent the last week or so eating traditional Colombian food. They also do a pretty delicious margarita which you deserve after your paragliding adventures! Make your way to the Metrocable and take a ride up to Parque Arvi. The nature reserve and archaeological site has plenty of walkable trails, beautiful wildflowers and outdoor markets on the weekend. Grab an empanada, browse the market stalls, explore the park and then relax in the sun until you have to go and pack your bags and head back to reality. If you can manage to get a few extra hours in, try and arrive at midday on Friday and do one of the free walking tours. They take a few hours but it’s a great way to see a huge chunk of the city, get your bearings and learn a bit about Medellin’s history. The Metro system in Medellin is a breeze to use, but there are also plenty of Ubers around and if there are two or more of you, they tend to be pretty cheap. Medellin might be the city of eternal spring, but it gets cold around the mountains so always take a jumper, especially when you go paragliding and to Parque Arvi! The best time to visit is in the dry season, from December to March.